The Chaikin Oscillator is a moving average oscillator based on the Accumulation/Distribution indicator. The Money Flow Index is a momentum indicator that is similar to the Relative Strength Index (RSI). It compares upward changes and downward changes of volume-weighted typical prices. This indicator can be used to identify the strength or weakness of a trend. The Negative Volume Index focuses on days where the volume decreases from the previous day. The premise being that the "smart money" takes positions on days when volume decreases. 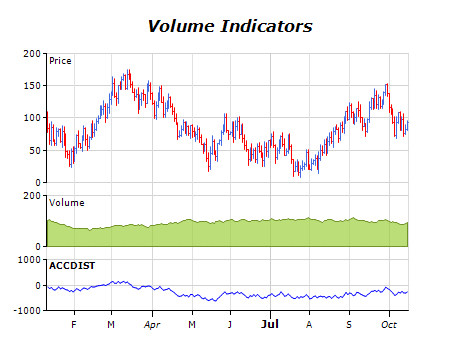 On Balance Volume is a momentum indicator that relates volume to price change. The Positive Volume Index focuses on days where the volume increased from the previous day. The premise being that the "crowd" takes positions on days when volume increases. The Price and Volume Trend is similar to On Balance Volume, in that it is a cumulative total of volume that is adjusted depending on changes in closing prices. But where OBV adds all volume on days when prices close higher and subtracts all volume on days when prices close lower, the PVT adds/subtracts only a portion of the daily volume. The amount of volume added to the PVT is determined by the amount that prices rose or fell relative to the previous day's close.